The Sandman Hotel was constructed in 1955 by H & J Construction Company. In a 1956 advertisement, the Sandman offered "Resort living at its finest." Owner/managers Clayton, Mary & Virginia Niven offered a variety of different room types, including studio apartments and more traditional rooms. Rates varied by season, with rates in the hot desert summer being the lowest. They even offered air conditioning, describing their rooms as "refrigerated." The advent of air conditioning in the 1930s created temperate indoor conditions that helped fuel both tourism and migration to the Sunbelt. 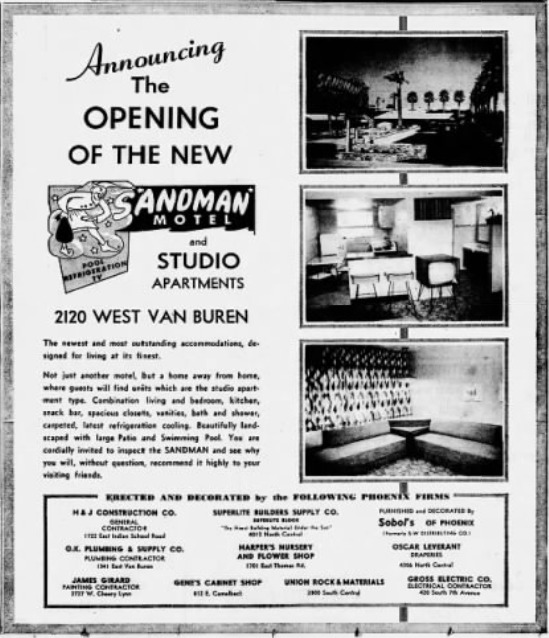 Unlike other hotels along the once-bustling avenue, the Sandman survived the development of the Interstate system. 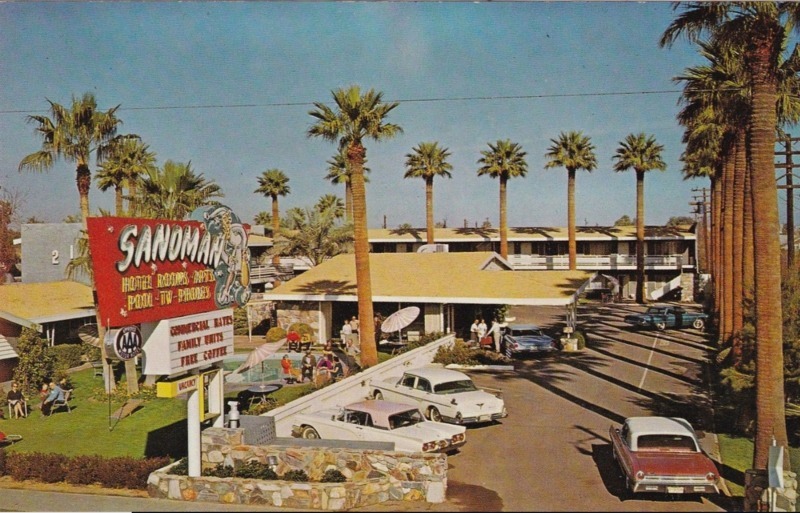 Today the Sandman is still in business, and it retains the same layout, including the presence of multiple large palm trees, that it had in the 1960s. Suzanne Collett, “The Sandman Hotel,” Salt River Stories, accessed April 18, 2019, https://saltriverstories.org/items/show/351. "Resort Living at its Finest advertisement," Arizona Republic, Sept 6, 1956, pg. 47.